Christmas trees are being decorated, cards are being sent, and the sales of Baileys are suddenly soaring. Not wanting to be the humbugs hiding in the archive, we’ve decided to put together a small display in Kirkby Library of Christmas related documents from our collections. Included in the exhibition are four Christmas cards, all from during, or shortly after, the First World War. The earliest of these is a card sent by a man serving in the Royal Flying Corps to his daughter back home in Huyton. 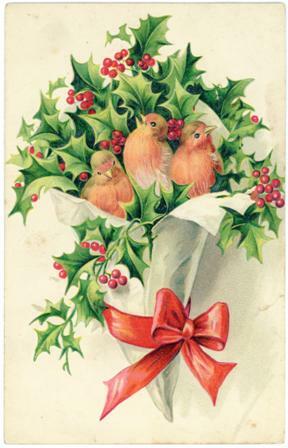 The straight-forward monochrome design of the card, featuring an image of fighter planes circling that must have intrigued the young girl when she opened the card, contrasts with a more saccharine image of three robins sent shortly after the end of the war in 1918; although the fact that the robins appear to be stuck within a parcel filled with jagged holly leaves does add a peculiar note to the picture. The third card is one that incorporates a strangely blurred image of a cottage surrounded by a decidedly un-Christmassy summer garden. The nature of the blurring is reminiscent of 3D pictures, but could be the result of some kind of production error. Either way, a father at some point, probably in the 1920s, selected the card to send to one of his children. The fourth card is a Christmas message sent from the Huyton Vicarage in 1949 with the “heartiest” greetings from the Rev. W.H. Lewis and his wife and would probably have been received by many Huyton residents at the time. 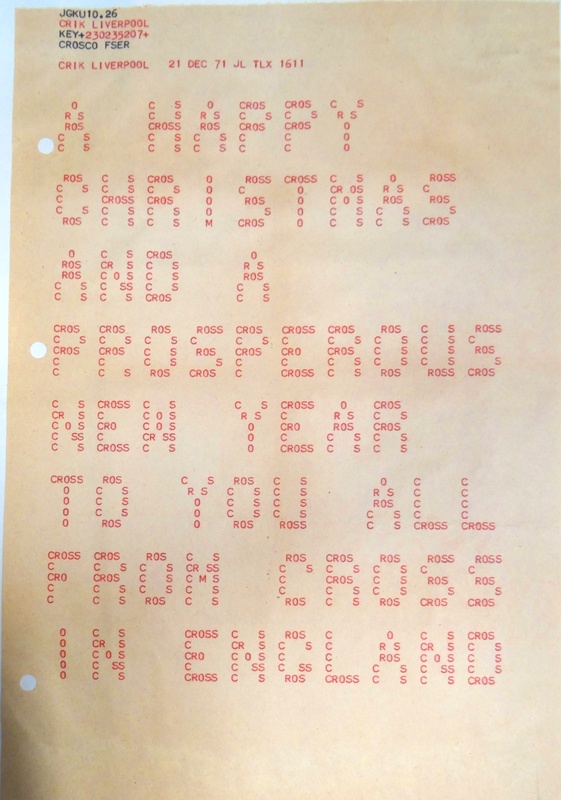 The offices and factory of Cross International in Kirkby were very keen on Christmas in the 1970s and our exhibition features three documents telling the story of their Christmas celebrations in 1971. As well as a photograph showing the children of staff members working their way through mountains of cake and wearing novelty hats at a party, we’ve offered a taste of what their parents were up to with the menu for their impressive looking Christmas Dinner Dance (if anyone’s ever had Cranberry Peach Boats, we’d love to know more). Cross International were a cutting edge company and they knew how to show off to colleagues and fellow companies across the globe. Why send a boring old Christmas card (that was so 1960s) when you can send a state of the art message where the very letters of the words are made up entirely of the word ‘Cross’? It’s a wonderful document that hints at the excitement that new, rapidly-evolving electronic technology offered, as well as the confidence of an international business. School logbooks can make fascinating reading, providing a revealing insight into the daily troubles, successes and challenges of school life. For this Christmas themed exhibition, we’ve included copies of two pages from the logbook of Whiston County Infants School. The first is from the Christmas period of 1938-39 and, as well as notes on the impact of snow fall (“attendance 52%”) in the New Year, it records that children were sent home for the Christmas break with milk vouchers. The second page, from 1953-54, features, alongside an alarming number of staff illnesses, an entry regarding the Christmas party to which, we can all be reassured to know, “Father Christmas arrived in good time.” Knowing Santa’s usual method of arrival, we’ll have to hope that school staff were already aware of how to remove soot fall from carpets, as it would be another few years before the Huyton magazine published that gem. The exhibition will remain up at Kirkby Library until at least the 8th of January 2016. The library’s opening hours are Monday, Tuesday, Friday: 10am-5pm; Thursday and Saturday: 10am-1pm. The library is closed all day on Wednesdays. During the Christmas period, the Library is closed from the 23rd December 2015 until the 4th January 2016, with the exception of Tuesday 29th December, when it is open as normal. *If someone gets the chance to test this, please report back with results!